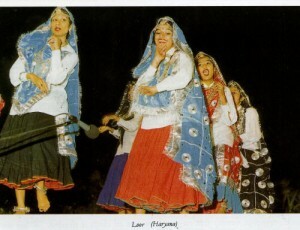 In Haryana the Loor dance, performed only by women, celebrates the spring season. It is danced during the later part of the bright fortnight of the lunar month of Phalgul (February/March). At the time of Holi festival men and women of all ages perform the Phagun dance. Autumn is the other season which inspires celebrative dances almost all over the country. The season is so inspiring because when it comes, the rains are over and the sky is gloriously azure, small patches of white clouds go languorously floating across the sky. This is the time when transplantation of seedlings is over and the villagers are hopeful of a good crop. Many of the dances performed to celebrate the autumn have ritualistic preliminaries which are performed for healthy growth of the plants in the fields.